Procedural sedation and Analgesia also known as PSA, is commonly used in the emergency room to perform painful or uncomfortable procedures. It can also be used in dental offices for patients expressing excessive anxiety or fear of pain with procedures. The medications used provide a light to moderate sedative action to allow patients to undergo painful procedures with decreased levels of consciousness but allowing for the patient to ventilate spontaneously therefore not requiring intubation. With light procedural sedation, the patient is able to cooperate more fully and respond to necessary commands during the procedure. Some of the more common indications for using PSA (previously known as conscious sedation) include setting fractures, reducing dislocations, cardioversion, transesophageal echocardiograms, and endoscopy. There is an increasing use of PSA for colonoscopy if full sedation is not required by the physician or patient. It is also occasionally used in palliative care or hospice for the patient who has a consistent 10/10 pain and cannot achieve comfort and pain relief from any other means. The purpose is to alleviate the excruciating level of pain and anxiety caused by these procedures or disease processes and yet not fully sedate the patient or compromise their cardiorespiratory status unnecessarily. This allows a procedure to be performed quickly particularly in emergency situations and allow other necessary diagnostics and treatments to be done in a more timely manner. For the palliative or hospice patient it assists in achieving comfort quickly and effectively when other options have failed. Dissociative sedation may be used as an alternative form of procedural sedation whereby the patient has little to no recollection (profound amnesia) of the procedure. The drug of choice for this is Ketamine. It allows for the amnesia affect while the cardiopulmonary system remains stable. Respirations continue to be spontaneous and airway reflexes intact. PSA is more commonly used as a moderate sedation technique on the continuum of sedation. The advantage is that airway intervention is avoided, but the risk for deeper sedation exists and must be anticipated for all patients. It is also possible that moderate sedation proves to be inadequate and deeper sedation is required which would then involve airway interventions. The physician or certificated nurse providing the PSA must be prepared for all possible outcomes and effects. Under the Nurse Practice Act (NPA) in most states and U.S. territories, a Registered Nurse can administer the PSA with all appropriate orders being given by a licensed physician, dentist or nurse anesthetist. States NPAs have various limitations for PSA such as Alabama where the RN administering PSA to have additional training, supervised clinical practice and demonstrate clinical competence to be allowed to administer PSA. Further, RNs in Alabama are not allowed to administer Ketamine or Propofol. In California, the NPA states it is within the scope of practice for any RN to administer medications that induce conscious sedation for short-term diagnostic, therapeutic or surgical procedures. This includes administration of Ketamine and Propofol. The CA NPA also states that the RN must have the knowledge, skills and competence for administration of any other medication. As with any procedure, it is the responsibility of the RN to know and understand the specifics of the scope of practice as defined and allowed by the NPA in the state where s/he is licensed to practice. All RNs are expected be knowledgeable about any medication they are administering and any medication the patients they are caring for have been given or will be given. Continuing education courses for nurses in subjects such as pharmacology and pain management are good choices for nurses interested in therapies such as Procedural Sedation and Analgesia. Pre and post procedural nursing care include attention to detail not unlike the care of any other patient. However, more frequent monitoring and astute assessment will be required. Knowledge of the PSA, the specifics of the patient’s plan of care, strong critical thinking skills and rapid recognition and response to any life-threatening emergency needs are essential to the successful outcomes. 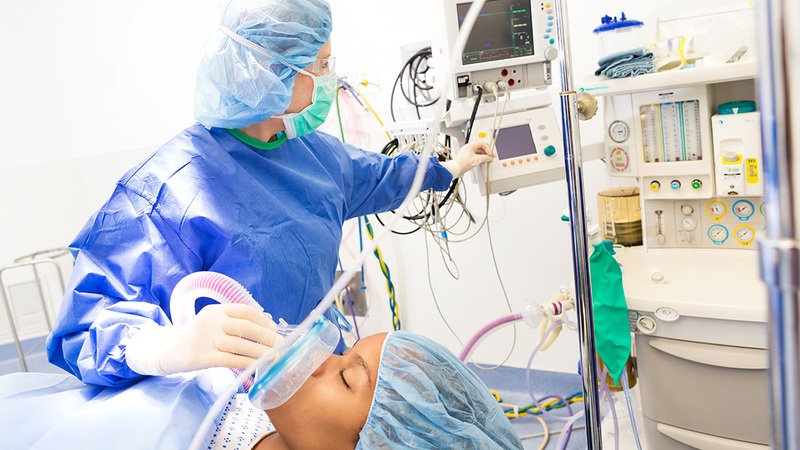 Some of the more common anesthetic medications used in procedural or conscious sedation include: Methoxitol, Etomidate, Propofol, Ketamine, Nitrous Oxide, Midazolam (Versed), Vallium. Other factors to be known to the nurse are the dosage, action, onset, peak effect, duration, side effects and reversal medications. Used alone, these medications have little respiratory or cardiac depression, but when combined with CNS depressants, synergistic effects can be expected. A thorough medication profile and history as well as previous analgesic and anesthesia is required. These medications should not be used in pregnant women, or if the presence of alcohol intoxication exists, or the patient has glaucoma. These are all fast-acting medications and if things are going to go south, they will do so quickly. Adverse effects can include allergy to the medication; respiratory depression and apnea; cardiovascular effects such as brady or tachycardia, hypo or hypertension, cardiac arrest; CNS suppression; and/or GI effects such as nausea or vomiting, hiccups or urticaria. Emergency medications to have on hand include: Benadryl, atropine, Glucagon, Dilaudid, Demerol, Fentanyl, and morphine. In addition, reversal drugs such as Narcan and Romazicon must also be available. Advanced life support may also be needed. Additional education and certification in Conscious Sedation for Registered Nurses (CSRN) is available from the American Association of Moderate Sedation Nurses (AAMSN). Certification for nurses in any field provides advanced knowledge and expertise as well as lifelong learning opportunities as advancements are made. Being certified in a specialty affords nurses the opportunity to become experienced while being supervised and educated and elevate their craft and skills to the highest standards possible. Certificates open more avenues for employment and career paths as well as a bump in salary. Recertification is required every 2 years. Thirty (30) CEUs are required for recertification. As of May 2013, the American Nurses Credentialing Center (AANC) allows for CEU credit to be given for life support courses such as PALS, ACLS, and NRP courses as part of the recertification requirement.